Despite its dramatic growth in the first half of the twentieth century, the Catholic Church later experienced a membership decline in Philadelphia, as it did in much of the United States. 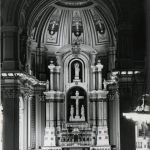 In 1993, the Archdiocese of Philadelphia made a controversial decision to close several churches, especially those in the city’s former industrial neighborhoods. The Church of the Gesú in North Philadelphia was once home to one of the city’s largest parishes, with twenty thousand parishioners at its peak. By the 1980s, both church and neighborhood were facing significant decline. In 1993, The Church of the Gesú was one of the many closed by the Archdiocese. The Church of the Gesú was saved from permanent closure by Jesuit clergy and the Immaculate Heart of Mary Sisters. The church became home to the Gesu School, the city’s first independent Catholic school. Unlike other parochial schools in Philadelphia, the Gesu School is not supported by a parish. About 450 North Philadelphia children attended the Gesu school in 2017, but only about 3 percent of them were from practicing Catholic families. The Catholic Church in Philadelphia was revitalized in the latter half of the twentieth century by an influx of Catholic immigrants. One of the largest additions to the city’s Catholic population was the Puerto Rican community. Small pockets of Puerto Ricans had lived in Philadelphia since the late nineteenth century, but immigration increased exponentially during and after World War II. Enticed by labor shortages in the city’s manufacturing and industrial sectors, tens of thousands of Puerto Ricans immigrated to the city, primarily settling in the Spring Garden and Fairhill neighborhoods and in nearby Camden, New Jersey. The Archdiocese of Philadelphia and the Diocese of Camden welcomed the new arrivals by providing them with a new church home and social services. 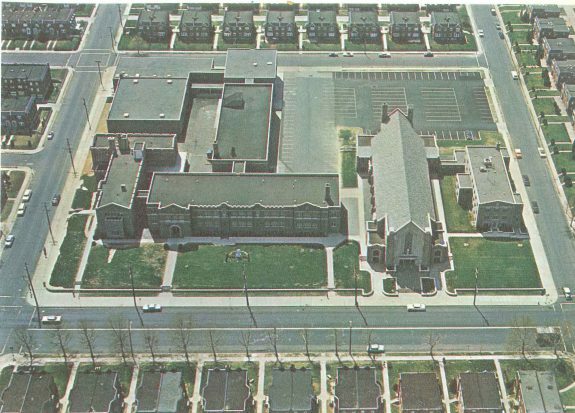 Our Lady of Fatima Church became a Puerto Rican hub in Camden, while the Casa del Carmen was established in North Philadelphia in 1954. Casa del Carmen provides the Latino community with affordable daycare, food and clothing banks, rent and utility assistance, English as a second language classes, and other vital services, as well as Mass services. 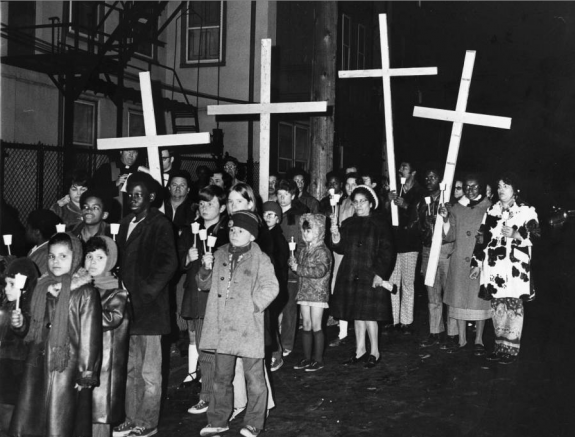 This 1972 photograph shows members of the Casa del Carmen community on procession in North Philadelphia. From a single parish in 1733, Catholicism spread across the city. In the late nineteenth and early twentieth century, the church’s presence peaked in the city, with parishes in nearly every neighborhood and suburb. This map shows the boundaries of each parish as they existed in 1949. Since 1993, the archdiocese has consolidated parishes and closed churches—moves routinely met with protest—in the face of a declining church membership and attendance. Old St. Joseph’s Roman Catholic Church, established in 1733, anchors the oldest Catholic parish in Philadelphia. The current building, shown here, was constructed in 1839. Old St. Mary’s Church was established in 1763. It was the second Catholic church in the city and located only one block from the older St. Joseph’s Church. “National” parishes served particular ethnic, racial, or linguistic communities. The first national church, Holy Trinity, was established in Philadelphia in 1789 to cater to the German-speaking community. Its creation was spurred by an influx of German immigrants. 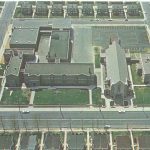 A testament to the Catholic Church’s significant footprint in Philadelphia, the St. Matthew Church and school complex in the Mayfair neighborhood of Northeast Philadelphia spans an entire city block. Nearly eight hundred students attended St. Matthew School in the 2016-17 school year. 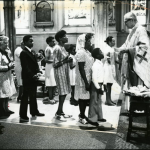 This 1976 photograph shows Holy Communion being administered at Our Lady of Mercy Church in North Philadelphia. Our Lady of Mercy was among churches that were later closed and demolished as the church’s demographics shifted. Parishes stand at the center of Roman Catholic religious life. Since the arrival of Catholicism in the Philadelphia region in the early eighteenth century, parishes have shaped Catholics’ sense of communal identity by functioning as both the administrative unit of a diocese and the primary site of Catholic worship. Developing into expansive complexes that often included a rectory, school, convent, and church, parishes reflected a considerable commitment of spiritual and financial resources. Many Catholics understood the region’s geography in terms of parish lines, and churches became among the most visible neighborhood landmarks. 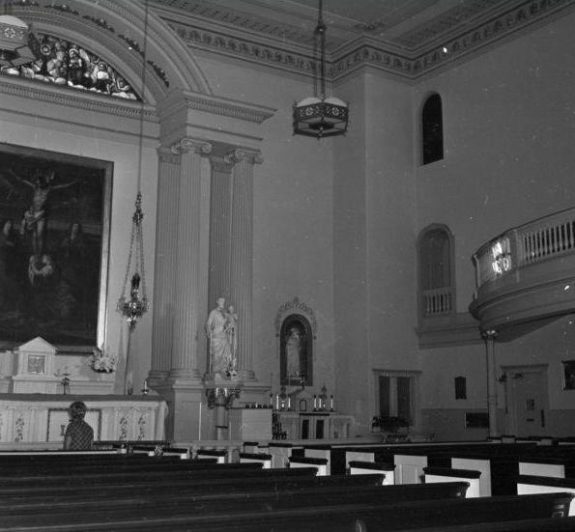 The foundations of Catholic parish life in the Philadelphia region date back to the establishment of Old St. Joseph’s Church (321 Willings Alley) in 1733. At the time, it was the only place in the English colonies where Catholics could worship openly as a community rather than having to hold religious services in homes and private chapels. It also provided a home base for circuit-riding priests who served mission stations scattered throughout Pennsylvania, New Jersey, and the mid-Atlantic region. 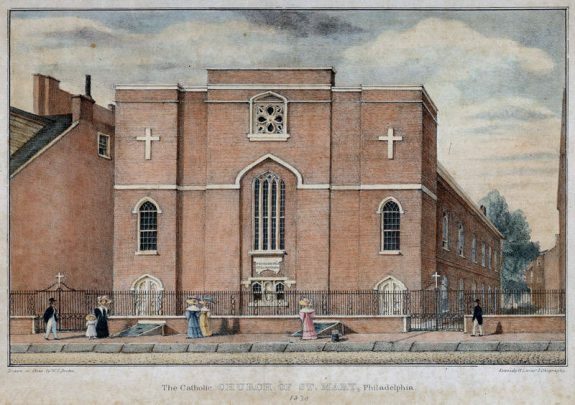 As the Catholic population of Philadelphia grew, Catholics constructed a second church, St. Mary’s (252 S. Fourth Street), one block away from Old St. Joseph’s, in 1763. By the time of the establishment of the Philadelphia Diocese in 1808, the number of churches in the city had doubled to four, with an additional twelve located across its territory, which at the time encompassed Pennsylvania, Delaware, and southern New Jersey. American independence provided Catholics with greater freedom to establish parishes, but the new political climate also resulted in administrative tensions that discouraged bishops from doing so. In the post-Revolutionary period, some members of the Catholic community challenged church authority by demanding that the laity be given a formal role in parish governance, just as their Protestant peers enjoyed within their congregations. 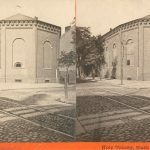 This led to a series of disputes within local parishes over what came to be known as “trusteeism,” the most prominent of which took place in the 1820s at Old St. Mary’s, where a schism occurred when a faction took control of the church to protest the bishop’s removal of a popular priest. In the wake of these controversies, the Vatican and the U.S. courts upheld the authority of the bishop and his appointed clergy over parishes and their property. Parish growth in the Philadelphia region accelerated dramatically during the middle decades of the nineteenth century in response to urban expansion and the influx of Irish and German immigrants. It continued apace during the late nineteenth and early twentieth centuries as Philadelphia’s immigrant ranks swelled with arrivals from Eastern and Southern Europe and population growth led to the development of new residential districts in and around the city. During this era of “brick-and-mortar” Catholicism, church officials often proved remarkably savvy in brokering real estate deals and marshaling the funds needed to complete ambitious building projects. Church spires rose over neighborhoods and parish plants sprawled over entire city blocks. 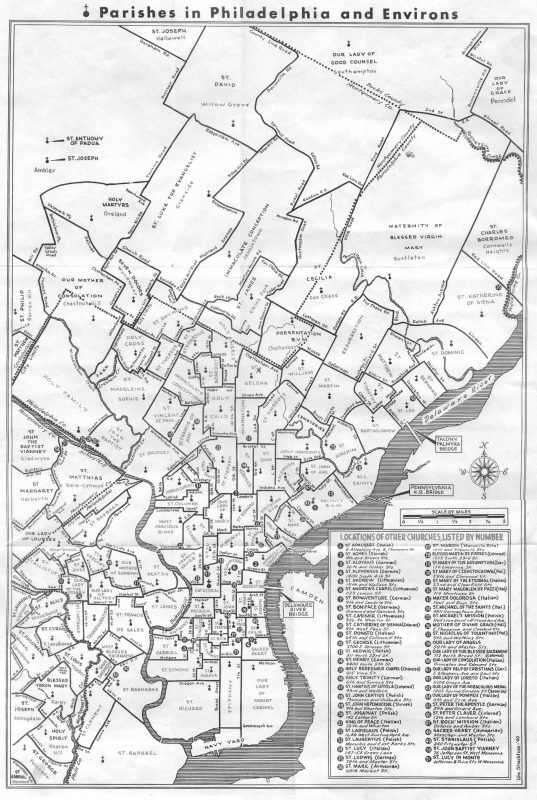 To manage this extensive parish growth, church leaders in Philadelphia and the surrounding region maintained a system of strict parish boundaries. As soon as a parish was established, the bishop formally defined its territorial geography in relation to neighboring parishes. Catholics were expected to register with the parish within whose boundaries they lived, receive the sacraments there, and send their children to that parish’s school. The parish, likewise, had to maintain registers for dates of baptism, first communion, marriage, and other rites of passage for all who lived within its boundaries. The system served a number of purposes, including eliminating competition among parishes and their clergy and committing individuals to support their local parish financially. It also helped keep Catholics rooted in their neighborhoods since moving even a few blocks could require a transfer of parish membership. Interspersed among these territorial parishes, “national” parishes served particular ethnic, racial, or linguistic communities. Philadelphia became home to the first such national parish in the United States in 1789, with the establishment of Holy Trinity to serve the city’s German-speaking community. Philadelphia likewise became home to the first Italian national parish in the country, St. Mary Magdalene de Pazzi, in South Philadelphia, founded in 1852. 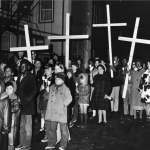 During the late nineteenth and early twentieth centuries, national parishes became the model for dealing with diversity within the U.S. church, with the system expanding to include national parishes for the Polish, Lithuanian, Bohemian, Chinese, and African American communities, among others. This overlay of territorial and national parishes accounts for the density of parishes in some Philadelphia neighborhoods, such as Port Richmond, where several churches stood in the shadow of one another. Responsive to the diverse needs of their members, parishes developed into hubs of spiritual and social activity. To encourage religious practice and deepen spiritual ties to the parish, church leaders sponsored preaching missions, organized devotional groups known as sodalities, and incorporated popular devotions into the life of the parish. 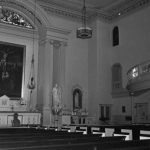 Among them, the practice of Eucharistic adoration services known as “Forty Hours” at each parish throughout the diocese became popular in Philadelphia starting in the 1850s before spreading nationally. Parishes also sponsored sports teams and musical groups, held dances and other social events, and provided a range of outreach services. Recognizing the importance that Catholics placed on parish membership and involvement, real estate and rental listings often identified the location of properties by the name of the local parish, and a number of parishes even sponsored building and loan societies to promote investment in the community. 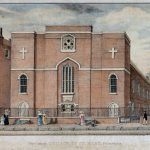 The strength of parish life in Philadelphia and the surrounding region from the mid-nineteenth century onward was intimately connected to the development of the parochial school system. Starting in the 1850s under Bishop John Neumann (1811-60), in response to anti-Catholic, nativist hostility and the needs of an immigrant population, parishes were encouraged to establish schools to provide catechetical instruction and protect children from real and perceived anti-Catholic influence within the public schools. At the Third Plenary Council of Baltimore in 1884, the U.S. bishops officially declared that every parish in the country with the means to do so should operate its own school. This decision spurred the massive expansion of the parochial school system in Philadelphia and elsewhere. In some instances, parishes prioritized the construction of the school building over the church itself, anticipating that the school would help draw families to the parish. The sponsorship of schools also strengthened the role of the parish as the center of Catholic family life and increased youth activity within the parish. Although the baby boom and the rapid suburbanization of the post-World War II years spurred the creation of new parishes and the physical expansion of existing ones, many older parishes struggled to adjust to changing circumstances. Since the 1970s, demographic shifts, declining church attendance, the high cost of maintaining aging sanctuaries, and a shortage of priests have all contributed to the consolidation and closure of parishes throughout the region. 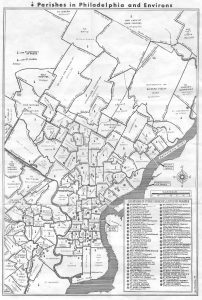 It was not until 1993, however, that the Archdiocese of Philadelphia implemented its first major restructuring plan and significantly reduced the number of parishes in North Philadelphia and the city of Chester. Systematic pastoral planning designed to evaluate parishes’ spiritual and financial viability led to a steady stream of closures that reduced the number of parishes in the archdiocese from 302 in 1992 to 219 in 2015. Responding to similar pressures, the Diocese of Camden announced plans in 2008 to shrink the number of parishes by nearly half, from 124 to 66, over the course of two years. Although parishioners who felt that decisions were made without adequate consultation rarely succeeded in reversing decisions, their public outcries nevertheless reflected the strength of parish loyalty among Catholics as well as a wider community concern over the loss of Catholic parishes and its impact on neighborhoods. Even as many parishes waned, new waves of immigration helped to revive and transform others. 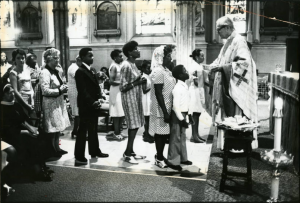 In the Philadelphia region’s cities and older suburban towns, an influx of Catholics from Latin America, the Caribbean, Africa, and Southeast Asia in the late twentieth and early twenty-first centuries brought new vitality to a number of parishes. Although the transition was not always welcomed by existing parishioners, it reflected a movement by church officials away from establishing new national parishes for various ethnic or linguistic communities in favor of encouraging different groups to worship within “shared” parishes. In addition, church leaders encouraged parish partnerships within regional clusters and the sharing of priestly personnel as ways of maintaining the continued viability and institutional presence of the region’s Roman Catholic parishes. Thomas Rzeznik is an Associate Professor of History at Seton Hall University and co-editor of the quarterly journal American Catholic Studies. He is also author of Church and Estate: Religion and Wealth in Industrial Era Philadelphia (Penn State Press, 2013). Bochanski, Philip G., ed. 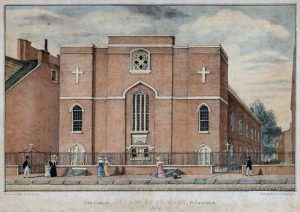 Our Faith-Filled Heritage: The Church of Philadelphia, Bicentennial as a Diocese, 1808-2008. Strasbourg: Editions du Signe, 2007. Coriden, James A. The Parish in Catholic Tradition: History, Theology, and Canon Law. New York: Paulist Press, 1997. Connolly, James F., ed. 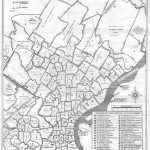 The History of the Archdiocese of Philadelphia. 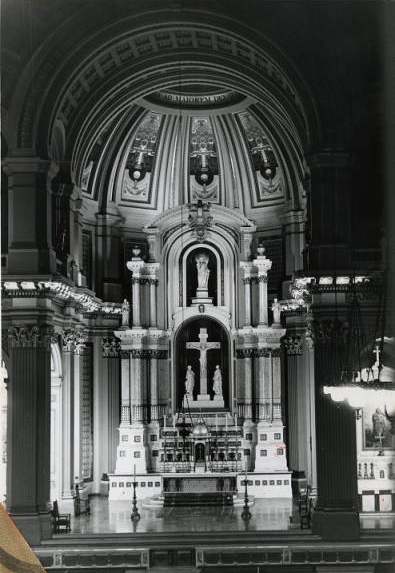 Philadelphia: Archdiocese of Philadelphia, 1976. Dolan, Jay P. The American Catholic Experience: A History from Colonial Times to the Present. Notre Dame, Ind. : University of Notre Dame Press, , 1992. Dolan, Jay, P., ed. The American Catholic Parish: A History from 1850 to the Present. 2 vol. New York: Paulist Press, 1987. Light, Dale B. Rome and the New Republic: Conflict and Community in Philadelphia Catholicism between the Revolution and the Civil War. Notre Dame, Ind. : University of Notre Dame Press, 1996. Kerlin, Joseph L. J. Catholicity in Philadelphia: From the Earliest Missionaries Down to the Present Time. Philadelphia: John Jos. McVey, 1909. McGreevy, John T. Parish Boundaries: The Catholic Encounter with Race in the Twentieth Century North. Chicago: University of Chicago Press, 1996. Rzeznik, Thomas. “The Church in the Changing City: Parochial Restructuring in the Archdiocese of Philadelphia in Historical Perspective.” U.S. Catholic Historian, vol. 27, no. 4 (Fall 2009): 73-90. Parish History Collection and Parish Registers, Philadelphia Archdiocesan Historical Research Center, 100 E. Wynnewood Road, Wynnewood, Pa.
Old St. Joseph’s Church, 321 Willings Alley, Philadelphia. Old St. Mary’s Church, 252 South Fourth Street, Philadelphia. Holy Trinity Church, 615 Spruce Street, Philadelphia. I am interested to find any information in your archives of St. Paul Parish established in 1843 at 923 Christian Street, Philadelphia, PA 19147. Thank you.